I love the picture of our room above. 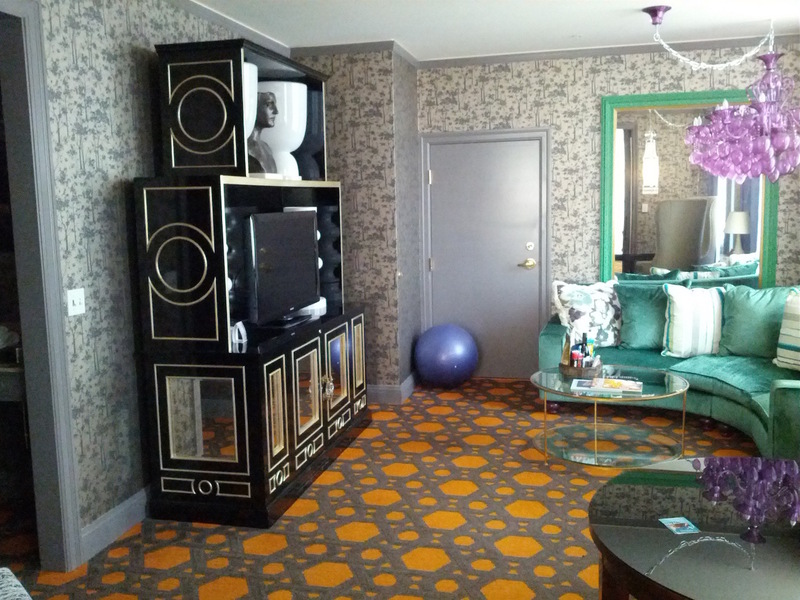 Whenever I see at it, I react just as I did the moment I walked into our suite at the Kimpton Hotel Monaco in Portland, Oregon. 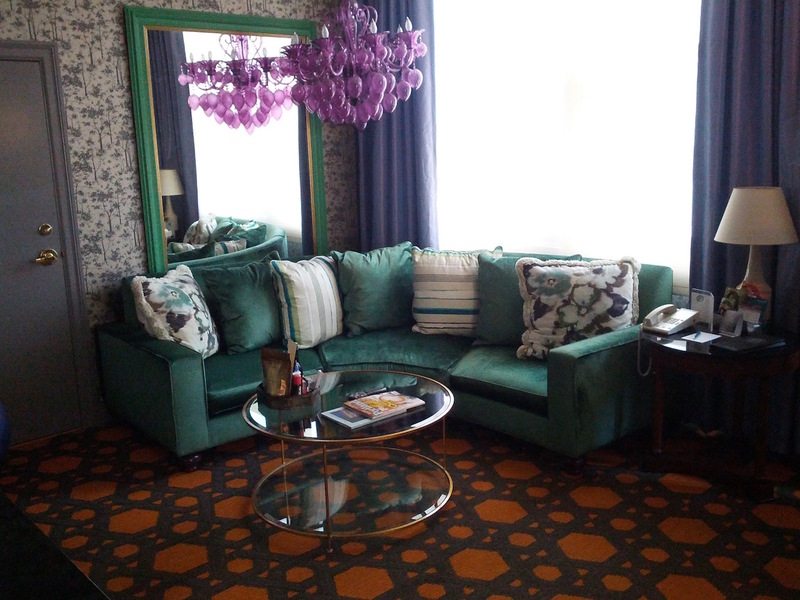 First I think – there’s a massive purple chandelier hovering over an emerald green couch on a patterned orange carpet – what? Then I notice how much I adore it for the perfect blend of odd and awesome. At the risk of being cliched here – that describes Portland perfectly. Laid back and forward thinking, a little bit hippy, a little bit forward-thinking entrepreneur – that’s the vibe you get for sure (and yeah, you start thinking in terms of vibes.). 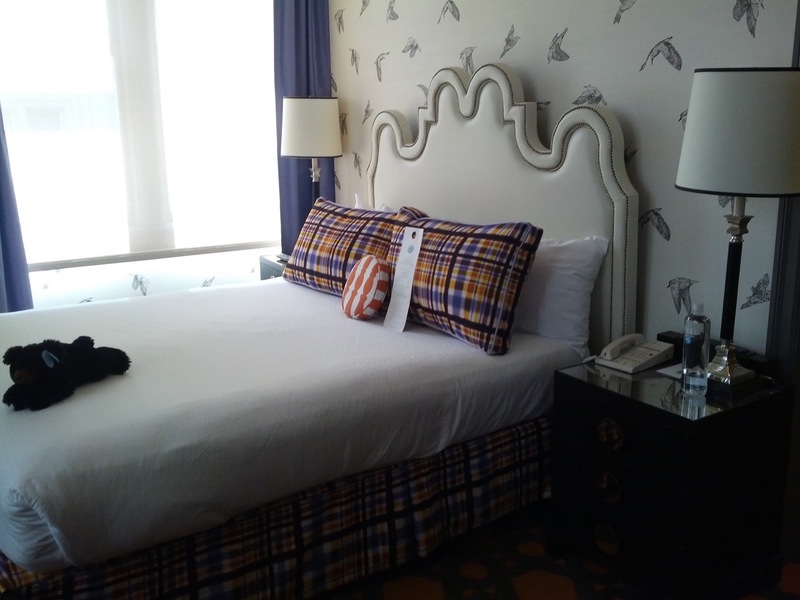 The Kimpton Hotel Monaco absolutely captures the spirit. 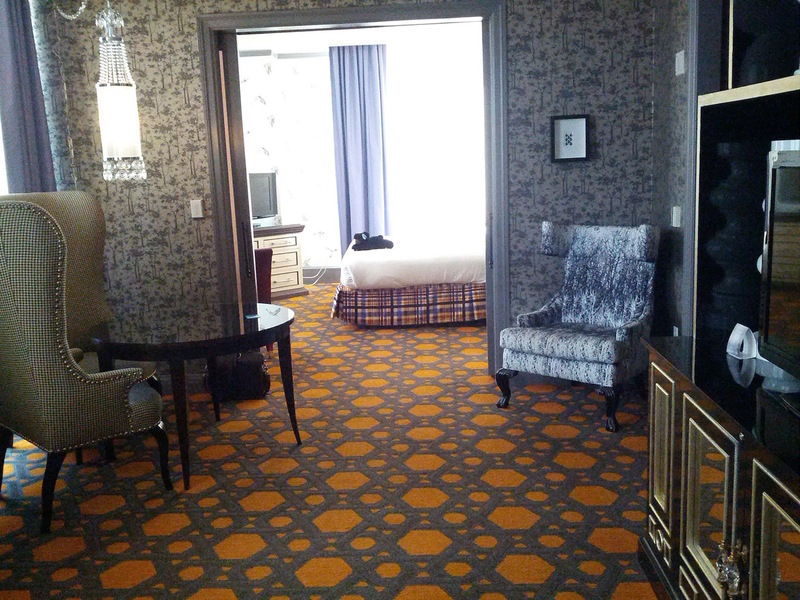 The room is amazing to look at from all angles, but it was also seriously comfortable. The couch was cozy, the windows generous to let in lots of sun, and the separate bedroom was roomy and breezy. The Hotel Monaco is nestled among the tall buildings of Portland’s downtown, but there was plenty of light to brighten up the space. Country whimsy – why not? Love. 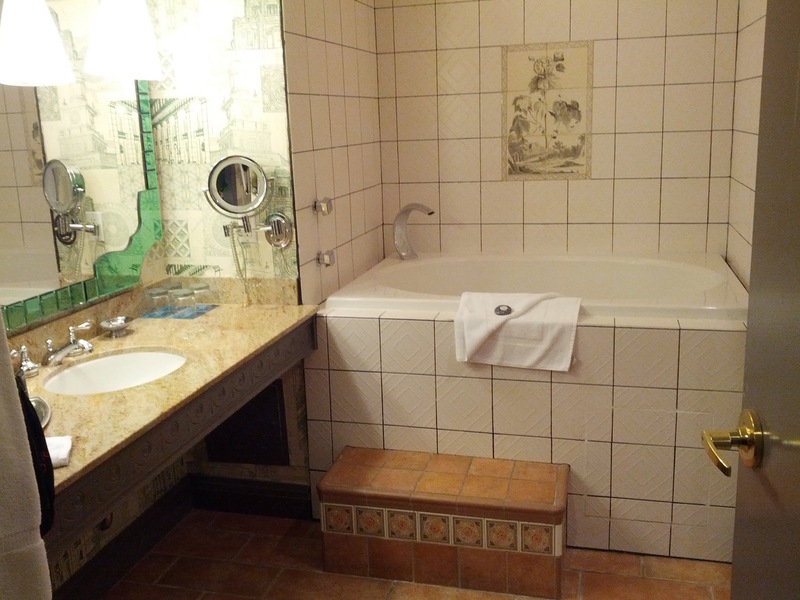 A generously-sized bathroom with deep soaker tub and a separate shower (not shown) completed the suite, and carried touches of quirky chic decor right through. You can unwind endlessly in your suite (and get all cozy in the plush, animal fur-patterned robes provided), but you’ll love how close you are to things-to-do while staying at the Hotel Monaco. It’s a very walklable city and our Hotel felt like it was in the very centre of it all. 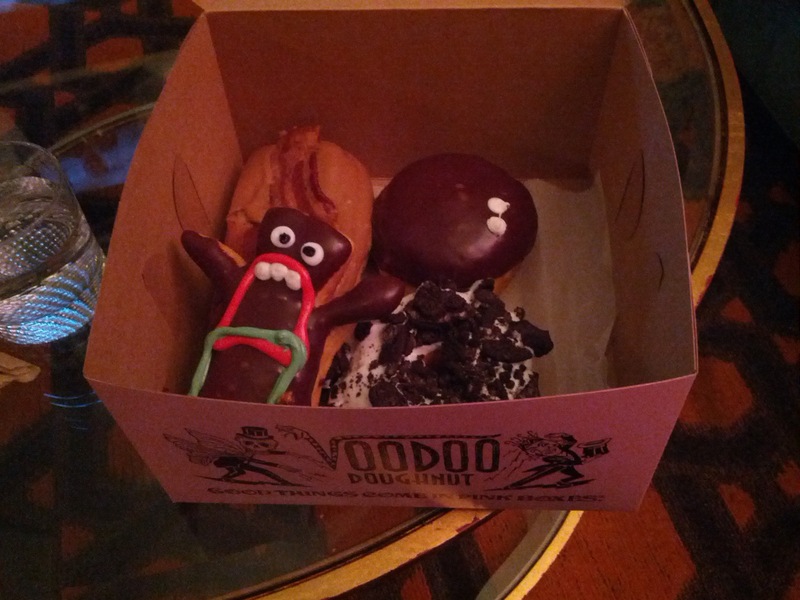 We walked to all of of our dinners with ease, including a late night post-dinner stop at the infamous Voodoo Donut for something sweet. There are several ‘pods’ of Portland’s famous food trucks that congregate fairly close by the hotel as well — definitely worth checking out this riot of sights, sounds and smells. Powell’s City of Books, the iconic new and used bookstore that spans a city block is a mere 8 minutes away. 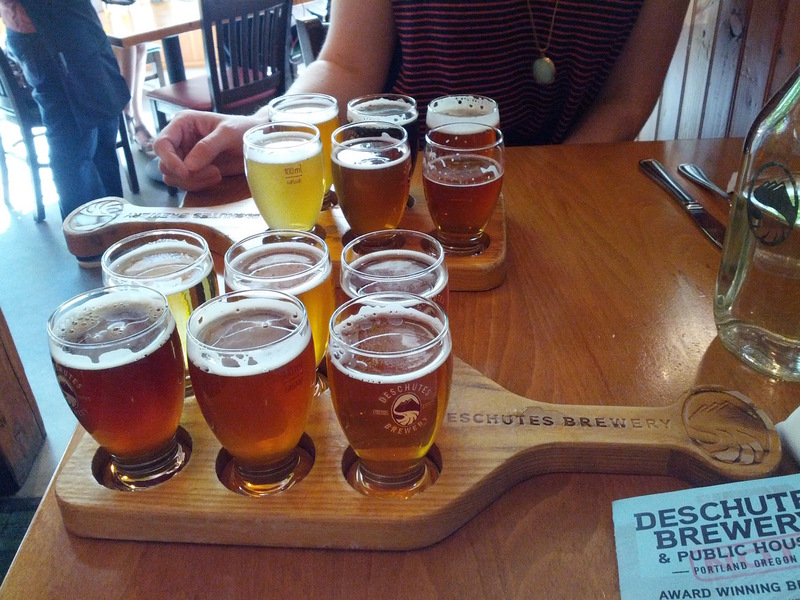 Also in this vicinity (virtually next door to Powell’s) is the Deschutes Brewery and Portland Public House where we had an amazing lunch accompanied by a flight of craft beers (or should I say beer accompanied by lunch). The sole time we used public transportation was when we took the light rail to the zoo (and we grabbed a cab to and from the airport). Granted, our goal was to eat well, drink local beers, look around, shop and enjoy — and we found we could do this all on foot with the Hotel Monaco as our home base. If you have further-flung plans, you may want to look into Portland’s most impressive public transportation infrastructure (light rail, streetcars, buses) which will surely help you out. But Portland is so walkable and you stumble on so many cool things, you might want to consider doing just that. Other features we absolutely loved about the Hotel Monaco itself were the wine tasting hour (a great pre-dinner ritual) in the main lobby – dazzling decor there as well. Lots of cushy seating and deep red walls. They serve coffee in this same space each morning, theoretically from some of the small, renowned local coffee shops, although in our experience Starbucks was the java on tap. No worries as we discovered Spella Caffe just a few steps away (60 second walk tops.) Here they pride themselves on sourcing the best beans, hand roasting and hand pulling your espresso and…it’s divine. Really and truly worth a stop here even if you aren’t staying right beside it. While we didn’t bring our furry friends this time, the hotel is also (very!) pet friendly. A large sandwich board greets four-footed guests with their names sketched in colourful chalk, and we saw a good number of dogs ‘checked in’ by the friendly staff. We highly recommend checking out Portland. We’ll be heading back!